In this entry, the second of sorts about design, we focus on proportion. It’s largely an aesthetic conversation. But we believe that the way a home feels can be just as important as how it functions. Hopefully the two work in tandem. Next week we’ll be getting down to the nuts and bolts. 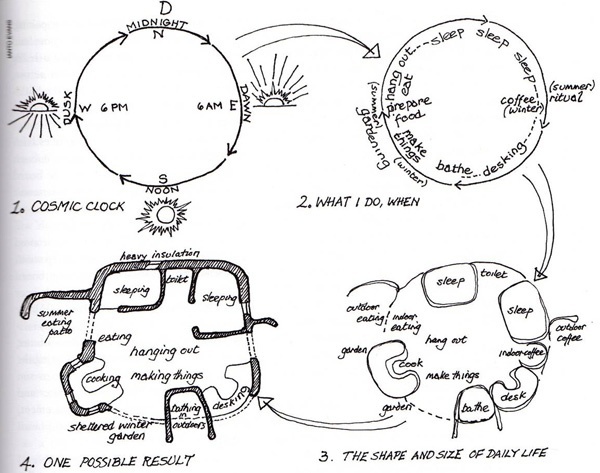 Starting a design is a bit arbitrary. But you have to start somewhere. 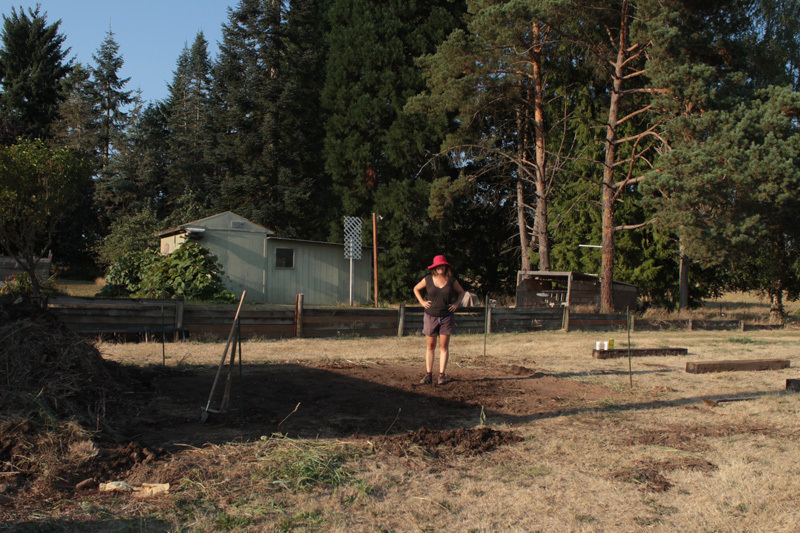 Our main constraint was that it had to be less than 200 sq ft. And we wanted a nice long wall facing toward the south (for reasons we’ll get into next week). So we started with those basic parameters. But what’s the ratio of the width to the length? We spent little time fussing and settled on the biggest golden rectangle we could fit into those 200 feet. I give my dad credit for introducing me the golden rectangle. There is a family lore about a painting my dad made in his late twenties. 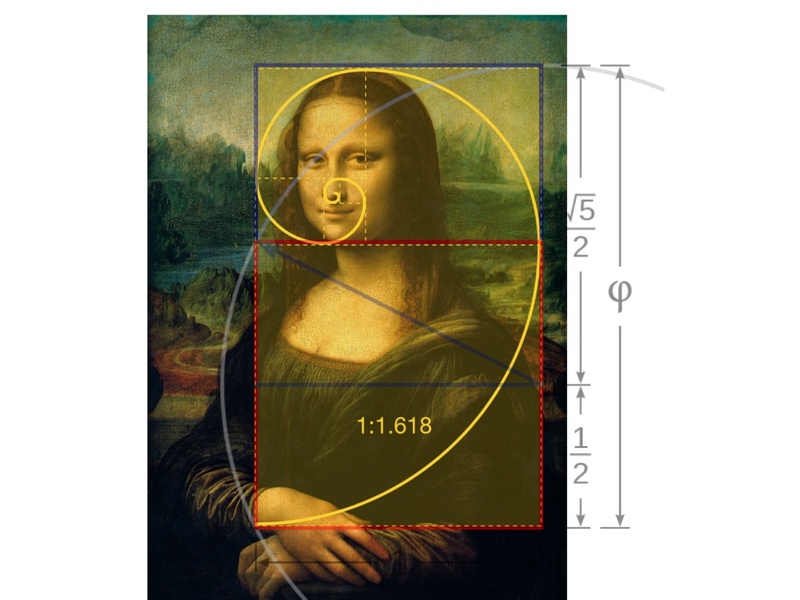 It’s simply referred to as the golden rectangle painting. I can’t picture the actual painting because it was lost when our house caught fire two and a half decades ago. But this painting get’s mentioned from time to time and I’m left to my imagination of what this thing looked like (though, there’s purportedly a photo of it floating around). This experience has created an allure around this famous shape. If you google it, you’re bound to get sucked into deep (albeit fascinating) chasm of nebulous ‘information’. Here’s a quick breakdown. This relationship is known as the golden ratio. Also written like this 1:1.618... This idea was known to the Ancient Greeks and, in mathematics, is signified with the greek letter phi ( Φ ). 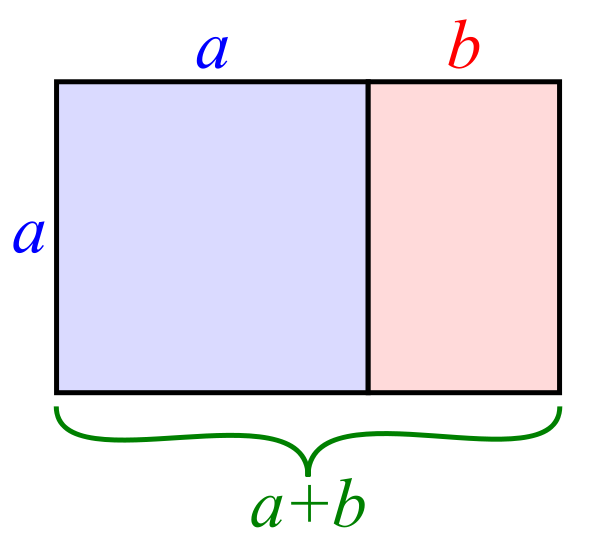 The red rectangle (also a golden rectangle) is proportionally equivalent to the whole rectangle. If you form another square within the red rectangle, you’ll have a smaller golden rectangle. Leonardo da Vinci and his pals were exploring this concept during the renaissance. They dubbed it, the divine proportion. The future is the sum of the past and the present. Anyhow, Fibonacci made no connection between his discovery and the golden ratio. But the two ideas are grappling with the same phenomena. For some reason, all these guys were drawn to this idea. It meant something perhaps. But it was all just a bunch of numbers. Now, here’s where the story gets good. 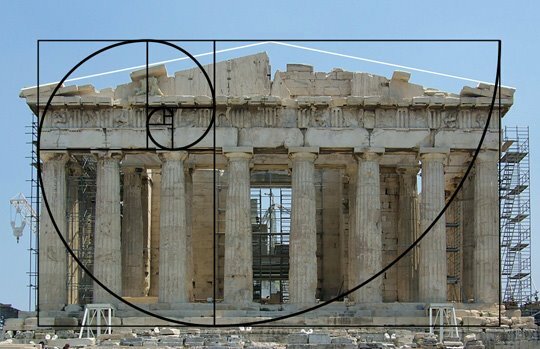 Eventually, scientists linked the Fibonacci sequence and Golden Ratio to flowers and trees and to human body, and there are examples of the patterns in art and architecture through the ages. 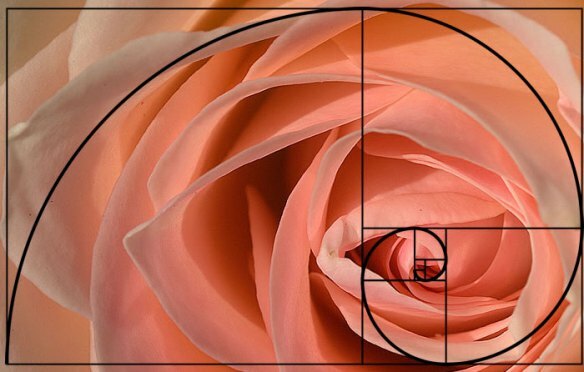 A rose and the Golden Rectangle / Fibonacci sequence. 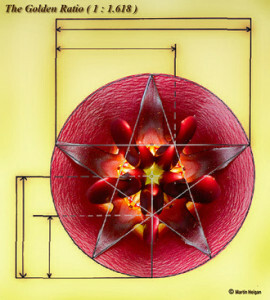 Another cool flower and the Golden Ratio. Mona Lisa seems to contain the proportions. A sculpture by Phidias. 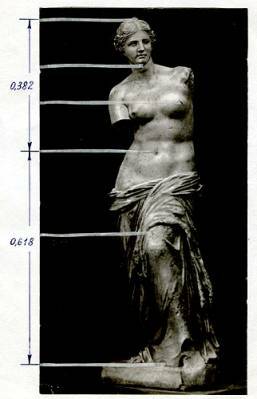 The human body from legs to navel and navel to head form a golden ratio. The Parthenon in Athens. The Greeks didn’t write about the ratio in terms of architecture, but did they “know” about it? There’s not much evidence to suggest that the Greeks or the Renaissance artists were consciously using the patterns in their work. But, just because they weren’t conscious of the patterns, doesn’t mean they didn’t know, intuitively, that the proportions they employed were simply right with the universe. 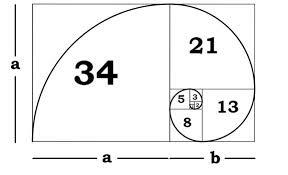 Indeed, that’s the allure of The Golden Rectangle. It just looks right. What does all this have to do with the tiny home? Nothing. Or perhaps everything. I’m fascinated by history and I enjoy the pursuit of understanding and being wrapped up in the mysteries of the Universe. So, it seemed, to both Denise and me, like a logical place to start. Our home wouldn’t be an arbitrary set of numbers, but something intentional– And something with meaning. Even if it can’t be comprehended. We crunched the numbers and did a bit of rounding and learned that our structure would be 11×18. That’s 198 sq ft outer dimension. With our varying width walls, our finished livable space would be 183 square feet. Ta-dah! That mystery is solved. When we shared the dimensions with more experienced builders, we were met with raised eyebrows. The dimensions are odd because they don’t gel with standard building materials. When it came to hang plywood sheathing or sheetrock or laying out thed subfloor, we would be making a lot of cuts and the excess might very well end up in the landfill. In the practical sense this can’t easily be debated. If we made our structure 12×16, our floor would comprise of 12 sheets of plywood perfectly and our outer walls would be 3 sheets by 4 sheets. We could have popped the front up two feet to use one sheet of plywood along the top and had our back height remain 8 feet. In theory, we could have put most the frame together without picking up a saw. No sawdust, no scrap. And that logic works well for a normal construction site concerned with efficiency and economy–make it fast and cheap. But Denise and I weren’t punching a clock. We were fortunate to have the time to create something that was meaningful and could serve our needs and satisfy our tastes. And as for the waste, in our case, most of our materials were destined for the landfill anyhow. But, when we did buy new materials, our subfloor for instance, the excess was minimal (our house is tiny, remember) and we were able to use the scrap. If you’re creative with the excess and put it to use, it’s not waste. We moved forward with the golden rectangle footprint. 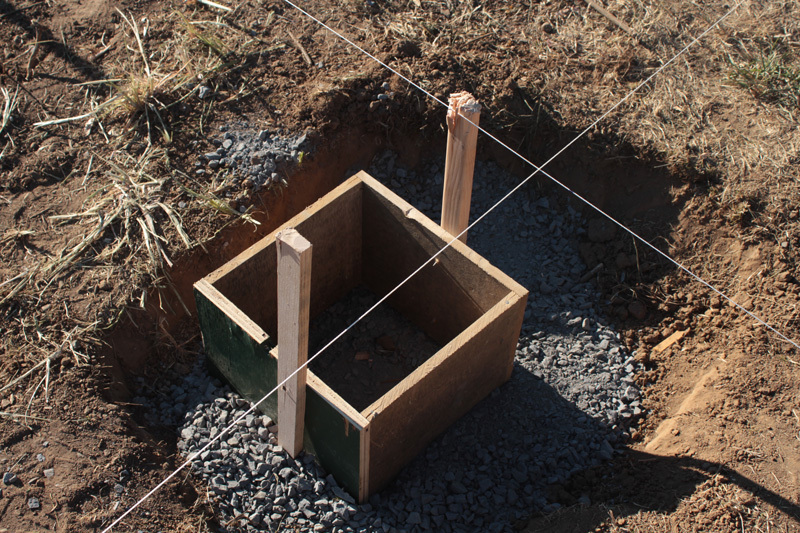 We poured six concrete piers to hold up a building we had yet to design. But we had some rough clues. We’ll share the next steps of design next week. 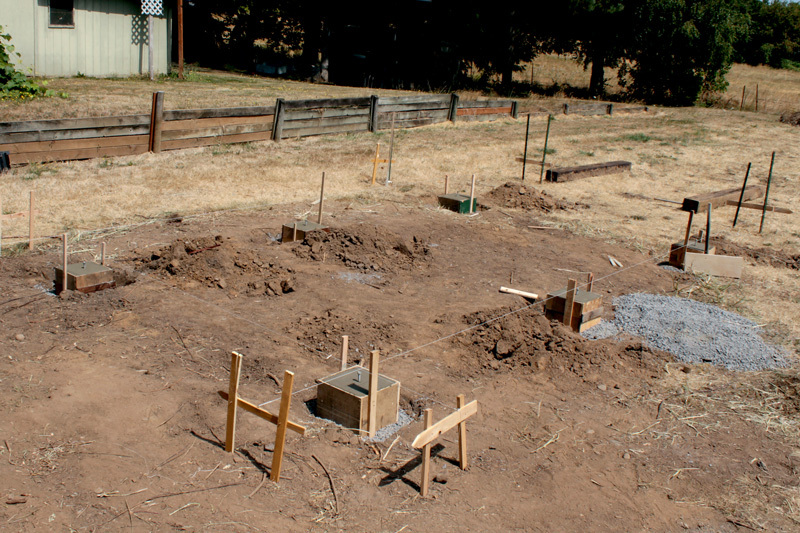 One good use for scrap plywood : concrete forms. Of course, the sequence is all off in a normal build. This was stuff we found at our salvage site.